Welcome to EveryLibrary's Action Platform. EveryLibrary is the nation's first and only political action committee for libraries. Welcome to EveryLibrary's Political Action Platform for libraries. EveryLibrary is the nation's first and only political action committee for libraries and organized as a 501(c)4. You can find out more about the full scope of our work at www.everylibrary.org. We designed this platform to help you take action in support of libraries at the local level through volunteering, making a one time donation or a small monthly donation, taking the pledge for libraries, or signing a petition. We want to give you the tools to make sure that libraries remain the cornerstone of well-educated communities throughout the country and this platform is of the tools we use to make that happen. EveryLibrary helps public, school, and college libraries win bonding, tax, and advisory referendum, ensuring stable funding and access to libraries for generations to come. EveryLibrary is the first and only national organization dedicated to building voter support for libraries. We do this in three ways: by training library staff, trustees, and volunteers to plan and run effective Information Only campaigns; by assisting local Vote Yes committees on planning and executing Get Out the Vote work for their library’s measure; and by speaking directly to the public about the value and relevance of libraries and librarians. Our focus on activating voters on Election Day is unique in the library advocacy ecosystem. This is reflected in the training and coaching we do for campaigns. In fact, EveryLibrary has helped libraries win over 210 million dollars in yearly stable funding. But we can't do it without you and your contributions. A contribution of just $5-10 a month goes a long way to fund the fight for libraries. Get Involved in the fight for Libraries today! 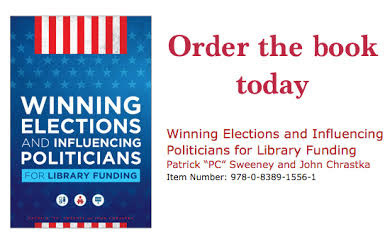 In each election cycle, tens of millions of dollars are at stake for libraries. Continue technical and capacity-building consultancy to the campaign and library. In each campaign, EveryLibrary engages with the local library community to determine our best level and type of involvement. We work best for you when we work with you to help make sure every type of library is supported at the ballot box.